Sometimes I get these fanciful ideas in my head -- like the notion that I went through more than one semester of baking classes or that I had proper pastry training when I prepared desserts for a local restaurant many years ago. Truth is, my baking is always part recipe and part prayer, like so many home cooks. Bon Appetit brought this recipe to my Facebook page and I gave in to my gluttonous lust for salty caramel and gave it a whirl at home, using the Tahitian vanilla beans from our Marx Foods Challenge. One note before you even start--this is an all day affair, and it's recommended that you let the cake sit overnight before topping it with the final layer of ganache, so make room on schedule to accommodate a good amount of--mostly inactive--prep time. Preheat the oven to 350°. Coat the cake pans with nonstick spray, line the bottom of the pans with parchment-paper rounds and then spray the paper with more nonstick spray. Putthe cocoa powder and chocolate in a medium bowl and pour the hot coffee over. Let stand for 1 minute then stir, making sure there are no lumps. Add the buttermilk and vanilla and put the bowl aside. Whisk the cake flour, baking soda, baking powder in salt together in a bowl. Using an electric mixer, cream the sugar and butter in a large bowl until light and fluffy. Add in the eggs one at a time, mixing fully between additions. Scrape down the sides of the bowl if needed. Beat until light and fluffy. Add the dry ingredients to this bowl in 3 additions, alternating with the chocolate mixture in 2 additions. Begin and end with the dry ingredients. Divide the batter evenly between the pans and smooth the tops with an offset spatula. Bake the cakes until a tester inserted into the centers comes out clean, about 35 minutes. Transfer to wire racks and let the cakes cool for about 10 minutes (they will deflate slightly). Run a butter knife around the pans to loosen the cakes and invert the cakes ontothe racks. Peel off the parchment and let the cakes cool completely. Flip the cakes over. If needed, trim the cakes--using a long serrated knife--to remove any bumps or imperfections. Put the chocolate and salt in a medium bowl. Stir the sugar and 1/4 cup water in a medium deep saucepan over medium-low heat until the sugar dissolves. Increase the heat to medium and cook without stirring. Swirl the pan occasionally and brush down the sides with a wet pastry brush. Cook until rich amber in color, about 9 minutes. Remove from the heat and gradually add the cream (the mixture will bubble a lot). Stir over medium heat until the bits dissolve. Pour over the chocolate in the bowl and add the vanilla. Stir until the mixture is smooth then cool slightly. Place 1 cake layer in a springform pan then pour 1 cup of ganache over. Chill inthe refrigerator until set, about 30 minutes. Cover the remaining ganache with plastic wrap and let stand at room temperature on the counter. Place 2 tablespoons of cold water in a small heatproof metal bowl and sprinkle the gelatin over. Let stand until the gelatin softens, around 10 minutes. Pour a bit of water-- around a 1/2-inch--into a small skillet set over medium heat. Transferthe bowl with the gelatin to the skillet. Stir until the gelatin completely dissolves, about 2 minutes. Remove the bowl from the skillet and set aside. Place the chilled cream and powdered sugar in a large bowl and scrape in the seeds fromthe vanilla bean. Beat the cream until soft peaks form and add the gelatin. Beat the mixture until stiff peaks form. Spoon the cream filling over the chilled ganache on the cake layer in the pan and smooth down the top. Very gently, place the second cake layer on top. Cover tightly with plastic wrap and chill until the cream layer is set, at least 6 hour--but, overnight is preferred. Remove sides from springform pan. 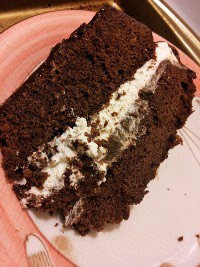 Using a knife or offset spatula, scrape off any filling that may have leaked out from between cakes and form smooth sides. Transfer cake to a wire rack set inside a rimmed baking sheet. Rewarm the remaining ganache until just warm. (I set a metal bowl over a large saucepan of simmering water until just warm, not hot.) Pour the ganache over the cake, using an offset spatula to help spread the ganache, if needed, to cover the sides of the cake. Chill until the ganache is set. Sprinkle the cake with flaky sea salt.